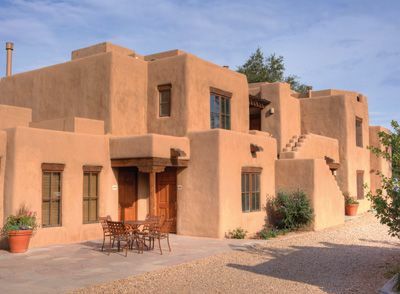 Santa Fe, New Mexico is an enchanting and inspirational city, and perfect way to enjoy it is with WorldMark Santa Fe and the rental of a timeshare in this wonderful city. Because timeshares offer so many amenities, and the rental, as opposed to owning, will save dollars in fees and maintenance. 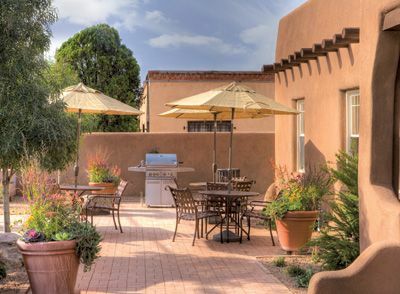 Located in the heart of Santa Fe, a short walk of five blocks from the Santa Fe Plaza, WorldMark Santa Fe reflects the Pueblo architecture and charm that distinguishes this city. Your home away from home will have a kiva fireplace, a tradition in this type of architecture, as well as a flat-screened television, DVD and CD player. Sit by the fire or relax in the comfort of your native-influenced surroundings; the charm and enchantment of the city, including local crafts, can also be found at home. 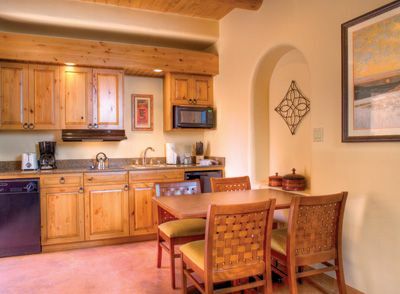 Although the food of Santa Fe is varied and delicious, cooking and eating at home, as well as entertaining, is possible with your timeshare. Movie rentals, laundry facilities, grocery service and a 24 hour desk are part of the amenities. Units include Hotel, Compact Studio, Special Needs Compact Studio, Compact One Bedroom that sleeps two, One Bedroom, and One Bedroom Special Needs. Most of the units require stairs for entry. Walk to nearby art galleries, shops and the Georgia O'Keeffe Museum, one of the largest exhibits of her work within the country. Exhibits change, so one can visit often. The Plaza hosts local artisans and is the perfect place to enlarge your collection of turquoise jewelry, enjoying the art and meeting those who hand-crafted the wares. Hand-crafted art and exhibits are found at the International Folk Museum and nearby Museum of Indian Arts and Culture, which often has exhibits of crafts and paintings from unique contemporary Native American artists. Sports abound in the Santa Fe area; in winter, one can choose from snowboarding, skiing, snowshoeing on the Sangre de Cristo Mountains and cross country skiing. Spring and summer bring hiking, road and mountain biking, several golf courses, fishing and horseback riding. Nearby to your timeshare, the Loretto Chapel beckons with its mysterious staircase and intriguing story. Walk to Canyon Road for another view of outstanding and eclectic art galleries and eateries. Festivals are numerous in Santa Fe; the Indian Market, Spanish Market, International Folk Market and smaller art markets are part of this historic city. The Burning of Zozobra and Fiesta de Santa Fe happen in September and are not to be missed. Travel to Albuquerque for the annual International Balloon Fiesta and ride the Sandia Peak Tramway for outstanding views of the city. 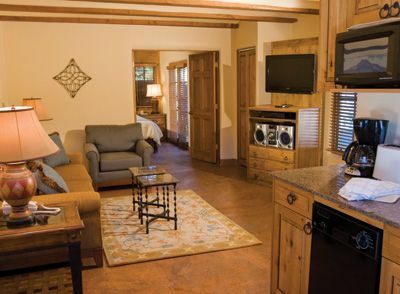 Your WorldMark Santa Fe resort is just the beginning of your "Land of Enchantment" adventure. Both Taos and Red River are exciting destinations and are nearby, exhibiting the scenic beauty for which New Mexico is famous. 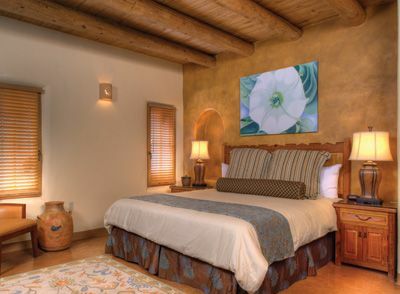 Contact WorldMark Santa Fe Specialist Today!